Ask LH: Are Smart Lights More Efficient Than Regular LEDs? Hi Lifehacker, I've been looking into kitting out my home with some smarter technology, but I'm wondering if the benefits are worth the steeper price. Are smart lights more energy efficient and long-term cost effective than standard LED lights? Cheers, Karan. By smart lights I figure you're looking at the likes of the Phillips Hue or the LIFX Wi-Fi connected bulbs that can be switced on and off remotely, as well as controlling colour and brightness. While these systems have a lot of advantages - both for prettying up your house and saving on energy - they're also a good deal more expensive than regular LED lights, especially when you factor in the cost of the lighting hub needed to control it all. Looking at the plain numbers, these smart bulbs aren't quite as efficient as the best 'dumb' Eco LEDs you can get on the market, but they're close. Philips' non-Wi-Fi enabled bulbs use 7.5 watts (a measure of energy usage) to produce 600 lumens (a measure of brightness), while the Hue bulbs draw around 8.5 watts for the same brightness. While they're far better than a traditional 50 watt lightbulb, they're still a tiny bit more of a drain than a regular LED. Let's also have a look at LIFX - their standard bulb runs quite a bit brighter at 1100 lumens, needing to draw 11 watts to produce that brightness. Other comparable LED bulbs need around 12-14 watts for the same brightness, so the LIFX may in fact be more efficient than other LEDs. At $US60 a bulb however, it's a steep price to pay. 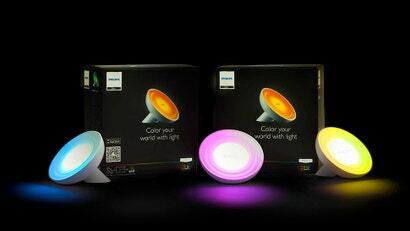 The obvious advantage of smart bulbs is the ability to control them remotely, however. This means that you can turn them off as long as you have your phone nearby, whether you're dealing with lights mistakenly left on while no one is home, or you just forgot to turn something off at the other end of your house. Smart lights are also dimmable, so if you don't need their full brightness, you can turn them down to consume less power. While smart lighting isn't necessarily any more efficient than non-connected LED bulbs, they do have a number of other benefits that may, depending on your needs, outweigh the initial cost of buying them. For those looking into eventually automating an entire house they can definitely be a worthwhile investment. ...and if there's a tendency for lights to blow in your house (wiring fault, poor connector, fluctuations in mains) then any potential savings are wiped out, the first time you have to replace a bulb. You could, of course, factor in the cost of an electrician checking & repairing the wiring and bayonet connectors in your house. Doesn't help if it's main fluctuations, of course.